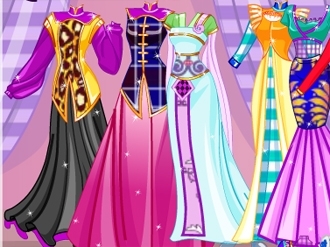 Dress up Chineese princess Mulan with emo style traditional dresses and accessories. Our princesses are looking to go out tonight with them boyfriends and of course they are looking to shine. 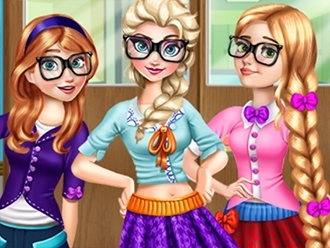 You will be their fashion designer and your mission is to choose the best clothes and accesories for the princesses. Let your imagination to work for your and make the princesses to shine. Good Luck! Elsa introduced two cute boys for Rapunzel. Rapunzel needs to go for a date with one of them. Who do you think suits her the best? Is it the 19 years old college basketball hunk who would take her to a NBA game for the date, or is it the 23 years old cutie who will take her to a fancy restaurant for dinner? Anyway, no matter which boy Rapunzel chooses, she will definitely needs your fashion advice for the date look! Help her choose an outfit and accessories that are most suitable with the date. If all the stars are lit, it means the look is perfect! 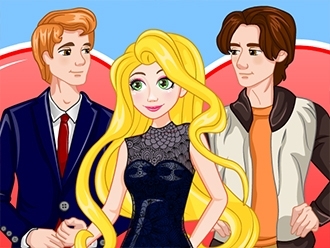 Have fun playing this fashion challenge game called Rapunzel Date Fashionista! 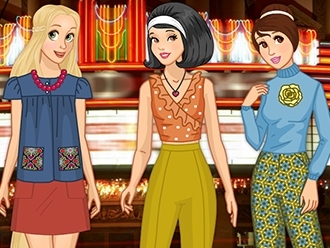 Travel with Rapunzel, Snow White and Belle back to the groovy seventies! When you're there, go look at store windows, closets and people's clothes and you will see bright colors, bell bottom pants, high neck tops and lots of tunics. I'm sure the princesses are loving trying something different!